Alan Schwarz is a former Pulitzer Prize–nominated investigative reporter for The New York Times whose acclaimed series of more than one hundred articles exposed the seriousness of concussions in the NFL and led to safety reforms for young athletes nationwide. His work was profiled in The New Yorker and honored with a George Polk Award, the Associated Press Sports Editors Award for Project Reporting (three times), and the 2013 Excellence in Statistical Reporting Award from the American Statistical Association. He and his family live in New York City. "An illuminating exploration of ADHD, brimming with intelligence and insight. Schwarz reveals the powerful cultural and economic forces fueling its widespread diagnosis and drug treatment. Those with the disorder will hear a voice of compassion. And those who may be misdiagnosed, a clarion note of caution." “ADHD Nation is a true rarity – a book that confronts an important subject with the authority of an expert, makes its case with the urgency of a red alert, and moves at the pace of a thriller." "In this powerful, necessary book, Schwarz exposes the dirty secrets of the growing ADHD epidemic." 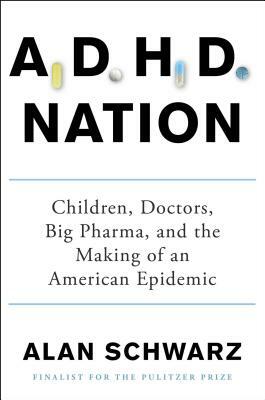 "ADHD Nation should be required reading for those who seek to understand how a field that once aimed to ameliorate the behavioral problems of children in a broad therapeutic context abdicated its mission to the stockholders of corporations like Shire and Lilly. Schwarz is sounding an alarm for a fire that looks nowhere near abating." "This eye-opening book should be a hit with drug-industry skeptics and worried parents who want to read a well-reported, definitive guide to this misunderstood and overly medicated disorder." "Mr. Schwarz’s disciplined focus gives his book clarity and even utility." "ADHD Nation is a necessary book. Schwarz has done a fine job on a maddening topic, and everyone who’s interested in hyperactivity, attention spans, stimulants, and the current state of American health care should grab a copy." "A dazzling piece of journalism, based on extensive research and an enormous number of interviews...an outstanding exposé." "[Schwarz's] nimble investigation interweaves the narratives of pharmaceutical companies with those of child psychologist Keith Conners, who led ADHD's 'Manhattan Project', and young people grappling with the medical fallout. An intriguing sidelight is the misuse of ADHD drugs as performance enhancers."